Charles Manson's pen pal gets confrontational in an interview. Also, David prepares for the end of the world and visits an extreme haunted house. David attends a voodoo festival in Benin, visits an infamous area of Johannesburg and speaks with white South African separatists. In Cambodia, David is offered the chance to shoot a cow. Later, he tours Myanmar before witnessing the cleaning of a mummified corpse in Indonesia. 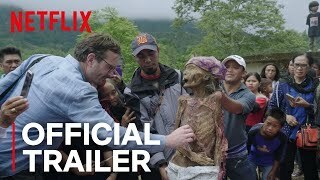 Currently you are able to watch "Dark Tourist" streaming on Netflix.